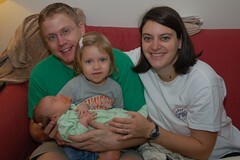 Eleanor had a big first weekend when Adams and Dudneys alike arrived in Atlanta to meet the new little girl. We had a great time, even if our Vols didn't provide us with a win. We missed our family that wasn't able to be with us - we look forward to visiting with you very soon when we make our first trek to Tennessee with two in tow. See weekend pics here.